Linen cotton pintucked duvet with cord embroidery. Single and king single sets includWhether you’re looking for something simple or a striking, graphic print, EziBuy’s extensive collection of Duvet Covers has a design you’re sure to love. If you’re looking for an elegant duvet set in a design and colour that’s neutral enough to suit any bedroom space, the gorgeous Paola Duvet Set is the one for you. 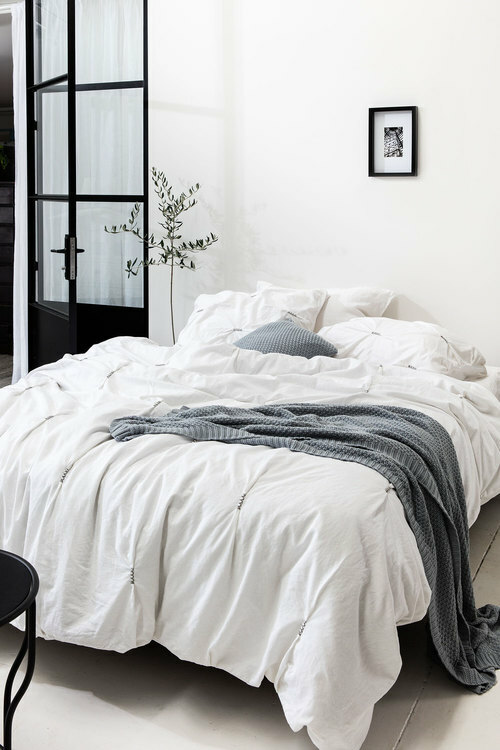 This duvet set comes in classic white linen cotton – which provides a chic monochromatic look on its own – but it’s the clever pintuck detailing which really makes this design stand out, elevating it from simple to sophisticated. Choosing bed linen in fresh white offers so many decorative possibilities – the Paola Duvet Set provides you with the perfect blank canvas. Enhance its minimalist appeal with equally understated furnishings and simple accessories, or bring in playful prints and pops of bright colour to create a stunning contrast. The Paola Duvet Set enables you to be as creative or as restrained as you like. Single includes one pillowcase, all other sets include two pillowcases. Front: 55% Linen, 45% Cotton. Reverse: 100% Cotton.